Journal Friday #94: Prepping a New Journal! My current journal is getting rather full, and I have something started on every page. It’ll probably take another month or more to wrap it up, but I wanted to prep a new journal because there’s always a transition time when I’m basically working in both the old and new journal. 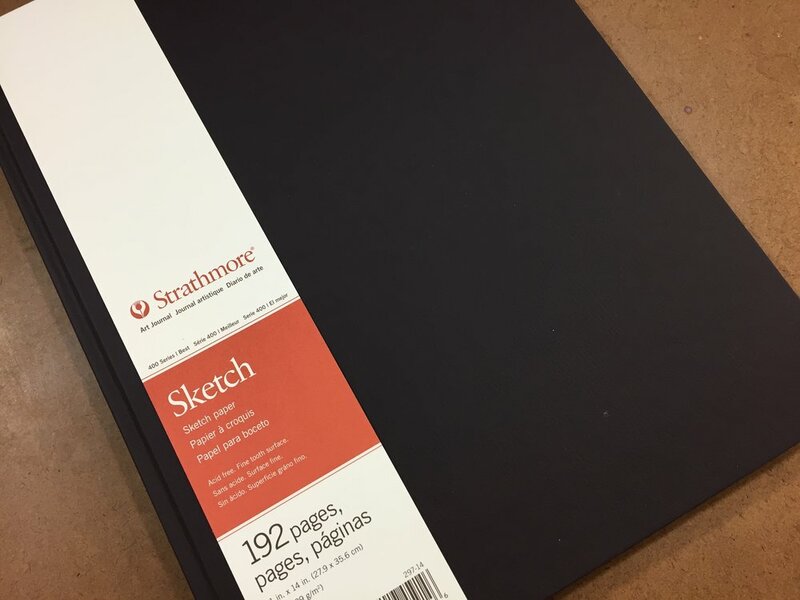 So, I took time today to begin prepping a new Strathmore Hardbound Sketch Journal. There are several rituals that I go through to get a new book ready. I always have a stash of stickers, and they’re great for decorating the outside of my journal. I tend to collect them, especially when I travel, and the cover of my journal becomes a document of a specific period in my life with the diversity of stickers. Today, I dug through my stash and found a few stickers to start the cover. I left plenty of room so that I can add more stickers as I collect them. After adding a few stickers to the outside, I turned to the inside front cover of the book. I like to put my contact information just in case I ever get separated from the journal. I also added the words “Initiated” and “Retired” so that I can add the dates of when I actually start working in the journal and when I retire the journal and stop carrying it around. I don’t like the word “Completed” because a journal is never really finished, and there are often pages that are left unresolved. It’s always good to have a way to hold all of the fodder that I accumulate, so a pocket is always part of my ritual. There are a number of ways to create a pocket, but I used a separate piece of paper and folded tabs on the sides and the bottom. I attached it with glue stick. I usually make the pocket so it’s about half the size of a page, and glue it to the final page in the book. A pocket like this can hold a lot. The final thing that I did to wrap up preparing the journal was to create a calendar in the back. I started on the front of the page that has the pocket and work backwards. That way I can add additional months as needed. I like to use highlighters to color code events and appointments. Despite using the calendar app on my phone, the calendar in my journal is my definitive one. Besides working to prep a new journal, I worked on my Creative Prayer Book adding to pages using watercolor pencil. I love building rich layers in my journals.